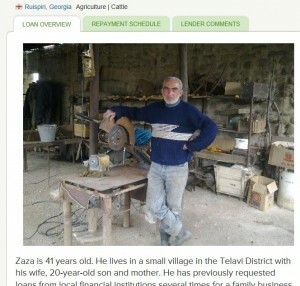 We loan money through Kiva.org. If you haven’t heard of it before, Kiva.org is a nonprofit that helps people overcome poverty by loaning money. Loans are made in increments of $25, and they help people build businesses, provide education for their children, and create better homes for their families. Since Kiva.org provides loans and not charity, empowering recipients to lift themselves out of poverty. And the lender is eventually repaid, so they can re-lend the money, helping another person. It’s a wonderful cycle of a small investment with the potential to make a big difference in the world. The other day, we received payment on a previous loan. So we had a credit in our account. My wife went looking for another loan to fund, and soon found Zaza’s profile. Let me tell you a little about Zaza. He and his wife live in Georgia, just to the south of Russia, and live a “subsistence poor” existence. Zaza is employed as a welder and his wife is a Kindergarten teacher. They also have a farm. 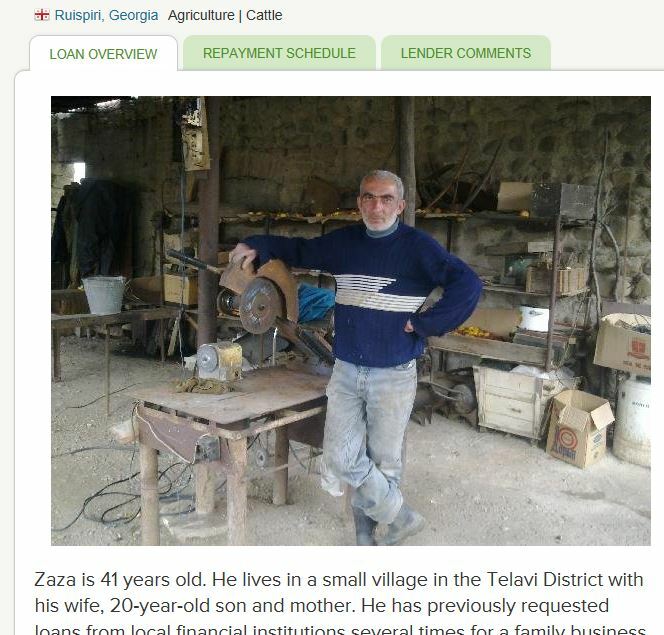 Zaza was requesting a loan so he can buy cattle and start raising livestock to supplement their income. What really caught our attention, however, was that Zaza has a vineyard and a peach orchard. There, in the mountains, with barely enough to support his family, Zaza grows grapes and peaches. He sells the fruit from his farm locally to help supplement his income and provide for his family. When we finished reading his profile, we knew we had to help out, and immediately re-loaned our money to him. After all, how can you resist a grape grower named Zaza? Now Zaza the Grape Grower is able to purchase cattle and earn a better living. We’re hoping that with the help of this loan, he and his family can make their dreams of a bigger farm and a better life a reality. And we hope that the local community will continue to enjoy the fruit from his vineyard, and that they are using it for their own home winemaking. Just so you know, this is our personal referral link. You can sign up with Kiva.org and make a loan. If you do, Kiva.org will give our account a $25 credit to loan out immediately. So by using the link above, you can fund two loans for the price of one. How cool is that? This entry was posted in Gifts, Miscellaneous and tagged Gifts by Noontime. Bookmark the permalink. Georgia is one of the oldest wine producing regions of the world, and they are still growing wine varieties no one in the States has even heard about, much less tasted. The commercial wine industry is criminal in how it has homogenized the wine options available to the consumer. For example, traditional Georgian “orange” wine is really a lost art, and experience, to most of the wine drinking world.